Well, I've nearly survived this week. It's been a long one. In the midst of everything, Riley got his first cold of the season, making him grumpier than usual. Still, we took advantage of the cooler, crisper, drier air and visited the park almost every day. The trees surrounding our favorite park are beginning to show hints of yellow at the tip tops of the leaves. Yesterday, I was actually covered in goosebumps because the air was so cool. And I was blissfully happy. Along with the cooler air comes my obsession will all things spiced. Cinnamon, nutmeg, ginger...all of those warming flavors are begging to be enjoyed in cookies, pancakes, and cocktails like this Ginger Spice Rum Punch. It's simple to make for 2 people but can also be made in large batches for fall parties. Did you know that today is National Rum Punch Day? Yep. Now you must try this. 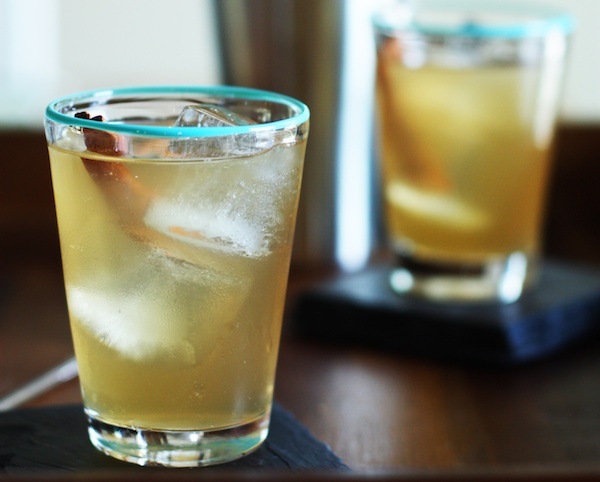 Combine the rum, simple syrup, and pineapple juice in a shaker filled with ice. Shake until well chilled and pour into ice filled glasses. Squeeze fresh lime juice on top. Combine all the ingredients in a small saucepan over medium heat. Bring to a simmer and stir until the sugar dissolves. Pour through a fine mesh strainer and allow to cool to room temperature before using.